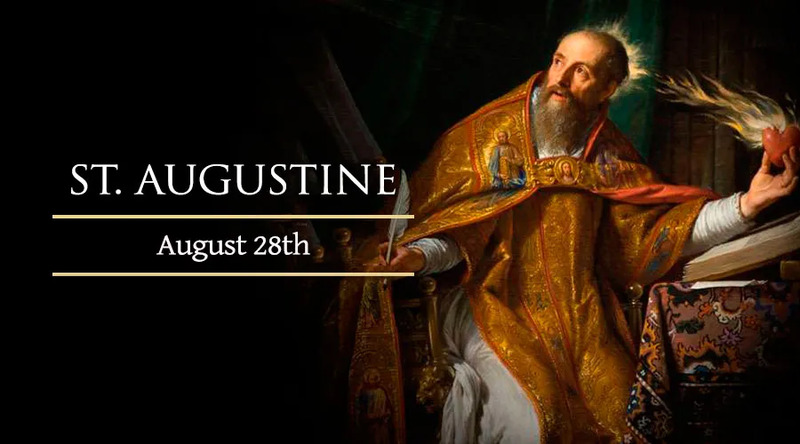 Today, August 28, the Church honors St. Augustine. Augustine was born at the town of Tagaste (now Souk-Ahras, in modern day Algeria) on November 13, 354 and grew to become one the most significant and influential thinkers in the history of the Catholic Church. His teachings were the foundation of Christian doctrine for a millennium. The story of his life, up until his conversion, is written in the autobiographical Confessions, the most intimate and well-known glimpse into an individual's soul ever written, as well as a fascinating philosophical, theological, mystical, poetic and literary work. Augustine, though being brought up in early childhood as a Christian, lived a dissolute life of revelry and sin, and soon drifted away from the Church - thinking that he wasn't necessarily leaving Christ, of whose name he acknowledges "I kept it in the recesses of my heart; and all that presented itself to me without that Divine name, though it might be elegant, well written, and even replete with truth, did not altogether carry me away" (Confessions, I, iv). He went to study in Carthage and became well-known in the city for his brilliant mind and rhetorical skills and sought a career as an orator or lawyer. But he also discovered and fell in love with philosophy at the age of 19, a love he pursued with great vehemence. He was attracted to Manichaeanism at this time, after its devotees had promised him that they had scientific answers to the mystery of nature, could disprove the Scriptures, and could explain the problem of evil. Augustine became a follower for nine years, learning all there was to learn in it before rejecting it as incoherent and fraudulent. He went to Rome and then Milan in 386 where he met Saint Ambrose, the bishop and Doctor of the Church, whose sermons inspired him to look for the truth he had always sought in the faith he had rejected. He received baptism and soon after, his mother, Saint Monica, died with the knowledge that all she had hoped for in this world had been fulfilled. He returned to Africa, to his hometown of Tagaste, "having now cast off from himself the cares of the world, he lived for God with those who accompanied him, in fasting, prayers, and good works, meditating on the law of the Lord by day and by night." On a visit to Hippo he was proclaimed priest and then bishop against his will. He later accepted it as the will of God and spent the rest of his life as the pastor of the North African town, where he spent much time refuting the writings of heretics. Augustine also wrote, The City of God, against the pagans who charged that the fall of the Roman empire, which was taking place at the hands of the Vandals, was due to the spread of Christianity. On August 28, 430, as Hippo was under siege by the Vandals, Augustine died, at the age of 76. His legacy continues to deeply shape the face of the Church to this day.